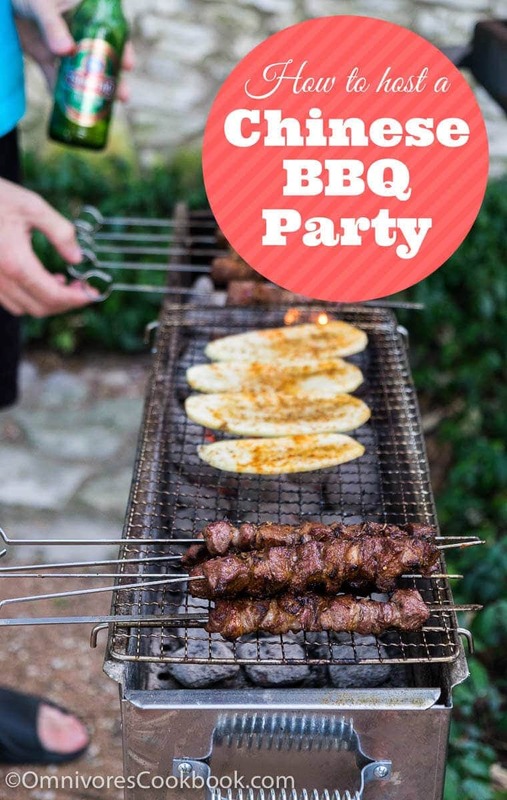 The ultimate guide to hosting a Chinese grilling and BBQ party in your backyard, with an introduction to a Chinese grill, tools, menu suggestions, workflow, and everything else! Enjoying a smoking-hot BBQ with cold beer is a big thing during the summer in Beijing. 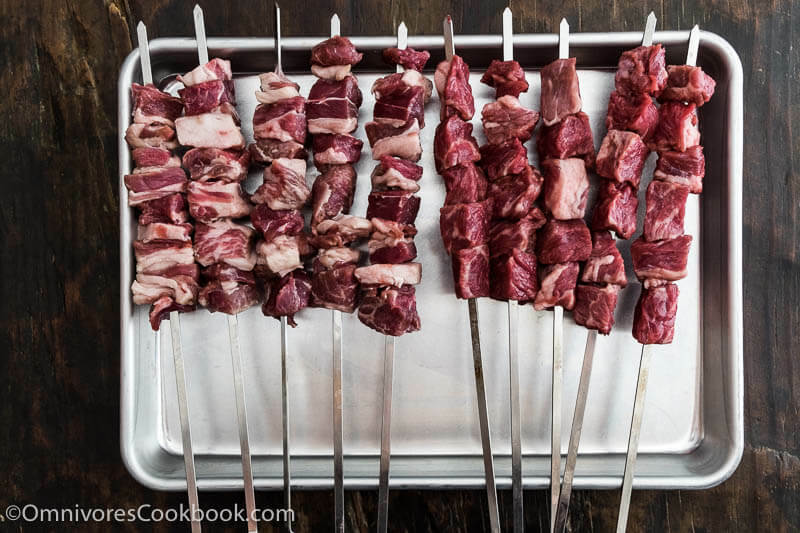 Contrary to American-style grilling, we cook with smaller cuts of meat and serve them on skewers. We also grill a lot of vegetables. Instead of devouring a giant chunk of steak, we enjoy nibbling on cumin-seasoned lamb skewers. Sometimes, we BBQ for hours, along with plenty of chatting and laughter. It is one of our favorite ways to relax and socialize. After moving to Austin, Texas, I hope that I can introduce the Chinese-style grilling party to the local community. 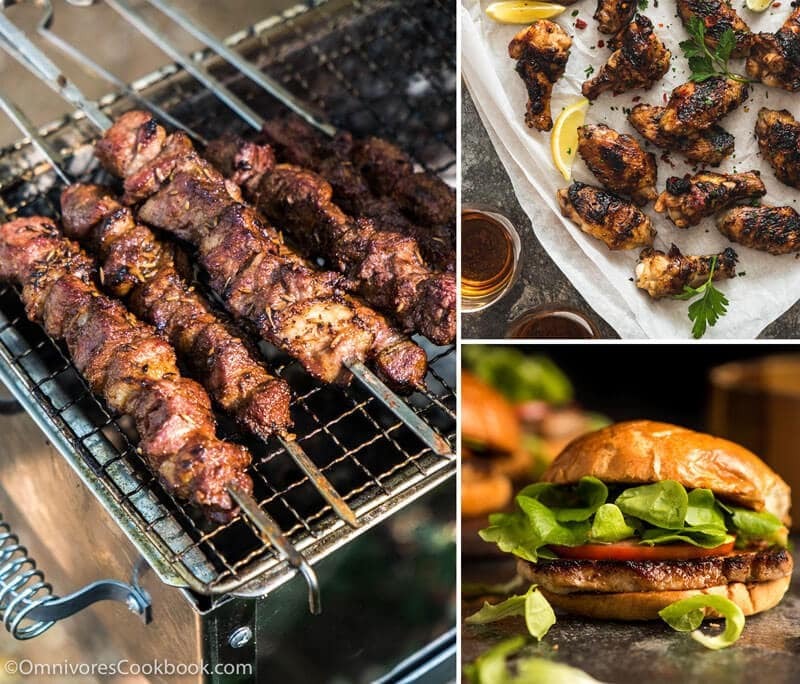 During the last few months, my husband and I have been hosting a few grilling events and classes with Kitchen Underground and Freda’s Kitchen. I was glad to find out that people enjoyed the food so much and that they sincerely care about Chinese grilling. 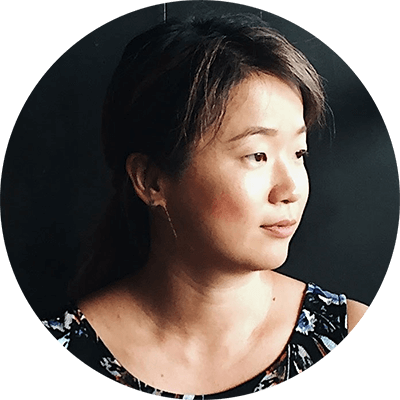 So today I want to wrap up our experience from the past events and teach you how to host a Chinese BBQ party in your backyard, from choosing your tools, picking out the menu, to designing a workflow. You don’t have to buy the whole set of equipment just for one party. However, if you want to do the real-deal Chinese grilling, this is the best way to go. The structure of a Chinese grill is very similar to the grill that cooks Japanese yakitori, Southeast Asian satay, and Middle Eastern shashlik. 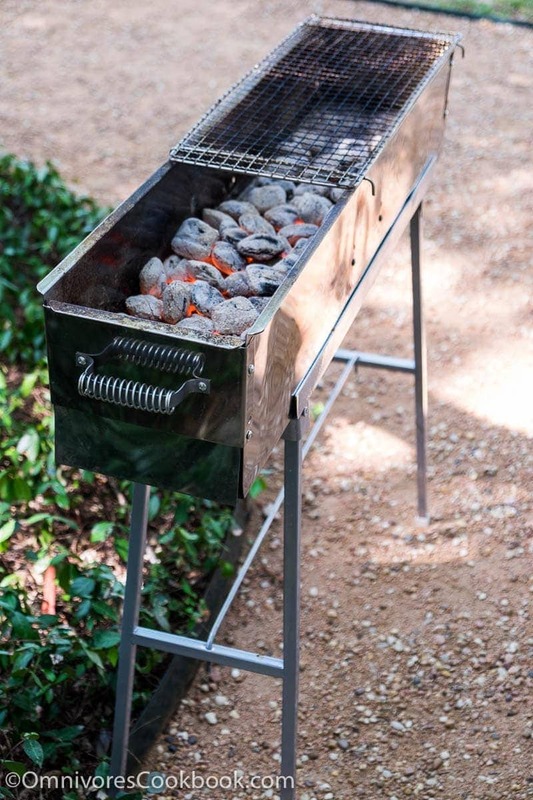 It is a 30-inch by 8-inch rectangular box made of thin sheet metal to hold the charcoal, and legs to hold the grill. 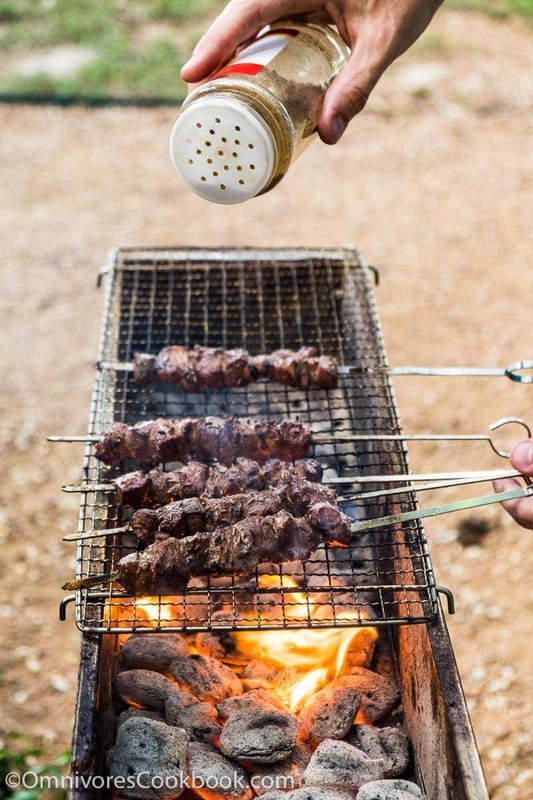 The grill is just narrow enough to hold the metal skewers with the meat fully exposed to the charcoal. It comes with a removable grate too, so you can grill steak and vegetables as well. The grill doesn’t have a lid, because you won’t need one. Chinese grilling usually deals with smaller and thinner cuts of meat, and the cooking is mostly done with direct fire in a short period of time. 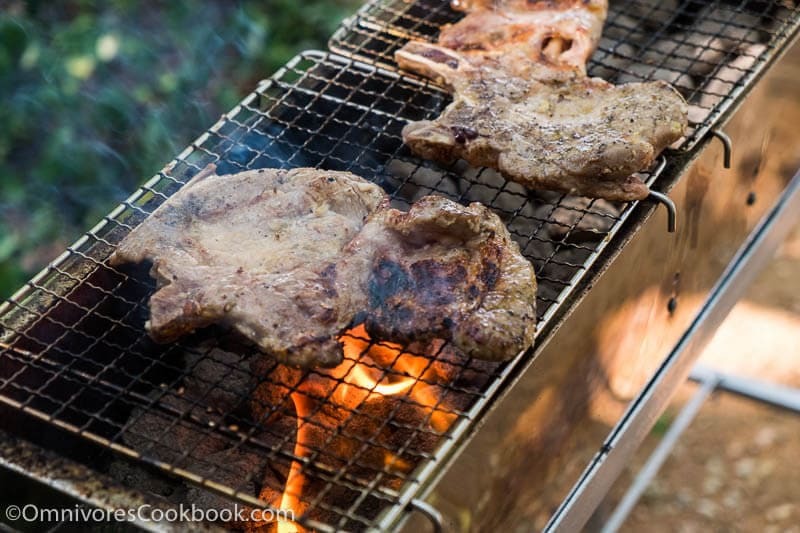 The grill itself is so simple, and yet it will change your summer drastically. Because it’s so small and shallow, it heats up in lightning speed and with a roaring flame. The assemble, cleanup, transfer, and storage involves minimal fuss. It is lightweight and the shape fits right into your car, and is as portable as a Weber tailgate special. You could easily haul it to your backyard or a park for a picnic or party! The only limitation is the narrow surface without a lid. But since the grill is so efficient, you can cut cooking time to almost a third for burgers, steak, chops, and vegetables. Plus, the shape is designed for skewers, so you can cook more skewers at the same time and they’ll done with a few flips. We got our Chinese grill from Amazon. You can see exactly how we use it in the photos below. The grill will work with any charcoal and briquettes. We especially love to use Kingsford professional briquettes. It only takes 15 minutes to get a full chimney of coals heated up and they generate a blazing hot fire – up to 900 F (480 C). They stay hot just like the original briquettes, so it’s perfect for cooking food for a large crowd too. We highly recommend using a chimney starter here. Because (1) you can start the fire effortlessly with a few pieces of old newspaper and a lighter, and (2) you’d want to get another half chimney’s coal ready halfway through the cooking, to keep the grill nice and hot. The overall cost is lower considering you’ll use them repeatedly. 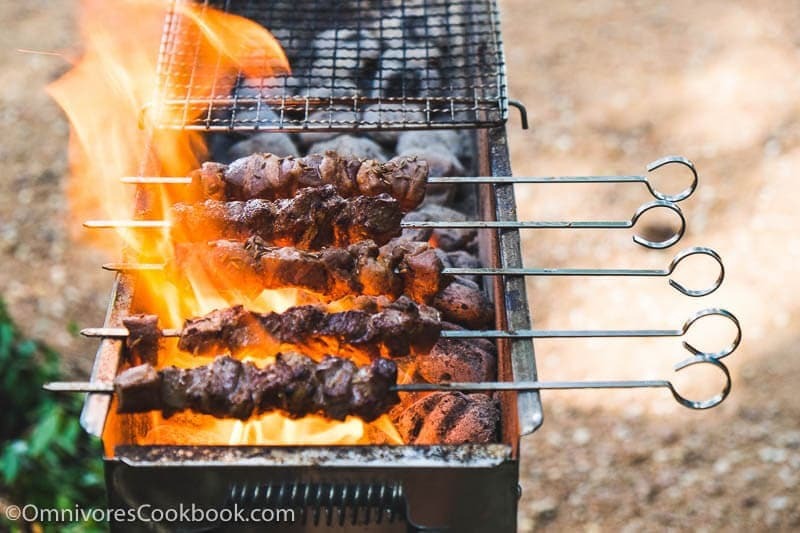 I’ve tried a few metal skewers and my favorite is the stainless steel skewers for kebab. The flat surface keeps the meat in place without rotating during cooking. The build is solid and cleanup is easy too. You do want two pairs of long tongs for grilling. You will need one pair to move raw meat and move the coals, and the other one for serving the cooked food. If you’re using the Chinese grill, you’ll find the air around the grill is very hot and it’s difficult to pick up the food with your normal kitchen tongs. You’ll need these to pour charcoals in at the beginning and to clean up the grill at the end. 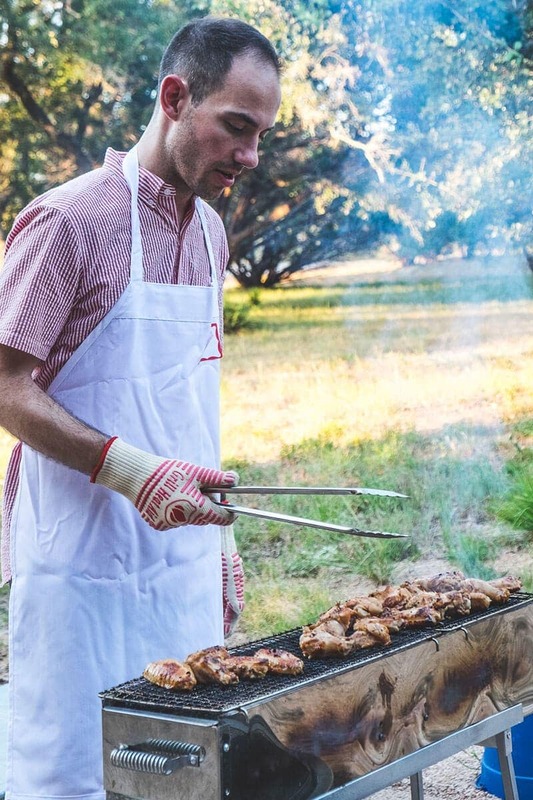 We love these Grill Heat Aid gloves because they resist 932 F extreme heat. You should always clean the grill grate after heating up the grill up, and right before cooking. The small grates that come with the Chinese grill are easy to wash. But they do rust if you don’t dry them well. So save yourself some trouble and clean the grate with a grill brush. Plus, you can use the brush to clean up the bottom of the grill after cooking too. I recommend that you serve 1 appetizer, 1 or 2 grilled meats as a main, and between 1 and 2 grilled vegetables as side. We love to serve a simple and refreshing salad that you can prepare ahead. 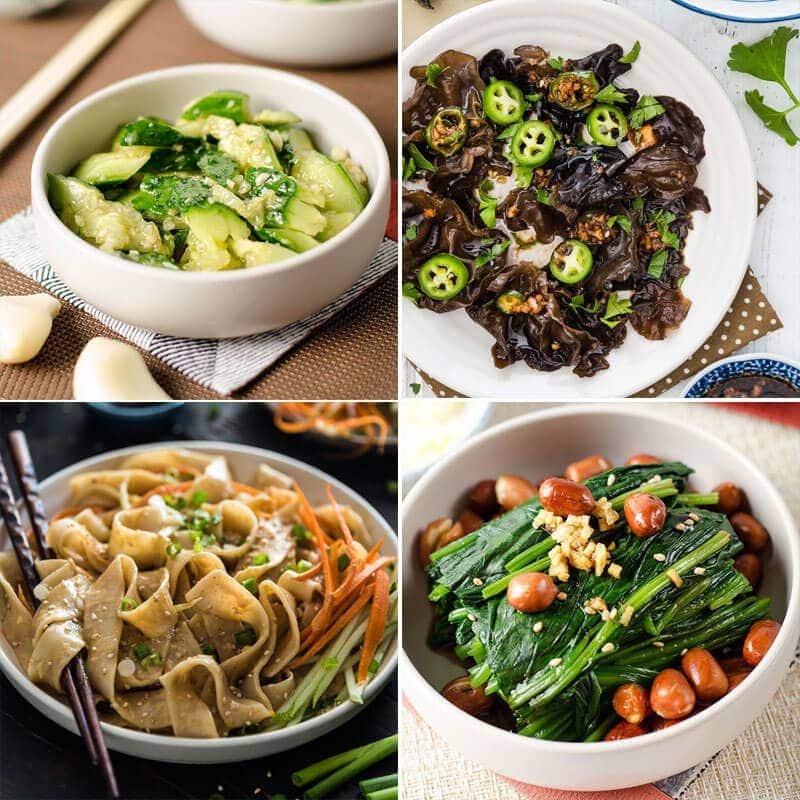 To do it in the Chinese style, consider cucumber salad, wood ear mushroom salad, cold sesame noodles, and Chinese spinach salad (a classic). If you’re hosting a large crowd, consider making a veggie platter with spicy peanut dip or homemade hoisin sauce dip. If you want a snack that piques the appetite, consider Szechuan spicy peanuts. As a Beijinger, I’d say that we consider the Xinjiang lamb skewers THE main dish. I simply cannot take it off my grilling menu. Sometimes the lamb skewers are the only main dish on the menu. What if your guests don’t eat lamb? No worries. 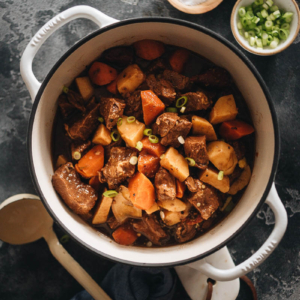 You can use the same seasoning and the cooking method to cook with beef as well. When we’re cooking for a large crowd, we also always choose the Macanese pork chop sandwich. This sandwich uses very thin pork chops, so it only takes 30 minutes to marinade and 5 minutes cooking time to create the most flavorful and juicy chops. Simply add a sliced tomato and a piece of lettuce, and spread a spoonful of mayonnaise onto the butter-grilled buns, and your guests will be very happy. The other dish we enjoy cooking is grilled wings. We always serve them as a part of the main, to make the menu looks more interesting. It is always a popular dish, but the only problem is that it takes more time and energy to cook. So I only recommend this recipe if you have less than six people to grill for. 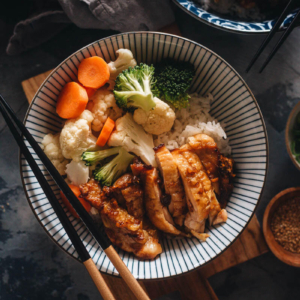 The other great main dish recipes: grilled chicken breast in black bean sauce or five spice chicken (you’ll want to replace whole chicken with smaller cuts such as thighs or breast). Living in the U.S. I know that grilled hot dog, burger, and chicken, are crowd pleasers. But after a few Chinese grilling classes and events, I’m surprised to find out that the most popular item is always the lamb skewers, with the savory wings coming in second. Those little skewers stay on top of the menu for good reason! In China, street vendors put almost everything on the skewers and grill them. Some of our favorite dishes are grilled potatoes (most popular) and grilled asparagus. They take no time to prepare and are easy to cook too. The other great option is to buy a loaf of bread, slice it, butter the bread, and season it with salt and cumin powder. Then you grill it until crispy. We serve grilled mantou (steamed buns) in China, and it’s spot on when serving with lamb skewers. Buy several types of beer and chill them in an ice bucket. Prepare water, sparkling water, and ice. And tell your guest the event is BYOB. That’s it. If you’ve been following my blog, you’d have known that dessert is not a big thing in China. It stays the same when it comes to a grilling party. Of course, your guests might expect dessert at the end of the party. My advice is to buy ice cream from the supermarket and serve it with fresh fruit. It’s always great to have something cold after the grilling, and the fruit adds a nice Asian touch. If you’re doing a fancy party, try out my espresso matcha ice-cream float recipe. Make sure to make shopping a priority on the same day of the party, and preferably in the morning. If you are going to use frozen meat, transfer it into the fridge the night before and let it thaw. Chinese grilling always involves the process of marinating. You can marinate right before the grilling, but if you can plan ahead and marinate the meat for 3 to 4 hours, it will become much more flavorful and juicy. Always prepare plenty of fresh ginger, garlic and green onion (if using wet marinade). Cumin powder (and whole seeds) and chili powder are must-have. We add these two spices on almost everything we grill, no matter whether it’s meat or vegetables or bread. You should also have soy sauce and Shaoxing wine (or rice wine), if marinating is required. After shopping, start prepping and marinating the meat. We use one-gallon Ziploc bags for all our marinated food. They take up less space in your fridge, keep the meat evenly coated with marinade, are easy to transport when you’re ready to grill, and keep flies away from your food. The next step is to prepare the salads and appetizer. If you’re making a salad, keep the dressing separately and mix everything together right before serving. 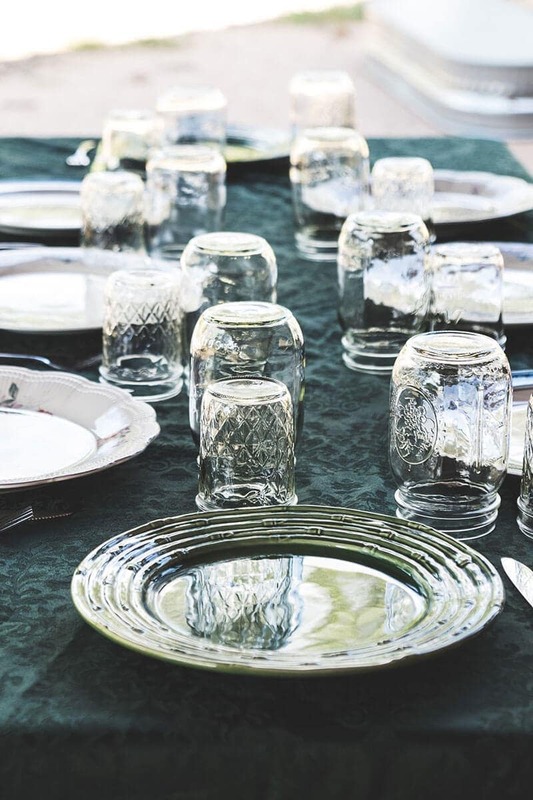 When we’re hosting a small event, we always use dinnerware from around the house. But if you’re cooking for a large crowd, do use disposable plates and forks to make cleanup easier. Always prepare a few large platters to serve the food in a family-style way. Do also prepare mosquito sprays. Your guests will appreciate it. If you plan to play music, check out Hakkasan Nightclub Radio on Itunes. They serve two types of music. The Hakkasan deep podcast is bright, ambient music. The nightclub podcast is upbeat party music. Use this little Bluetooth speaker so you can stream music from your phone. Right before the party, you want to get your grilling area ready. Start the fire and set up your grill. Transport grill and tools, food, extra spices (often cumin, chili powder, salt, and pepper), oil, and serving trays to your station. We own a service cart, just like the ones that hotel staff use to clean rooms. When we host a backyard party, we use it to load up everything so we only need one trip from our apartment to the grilling station. When your guests have arrived and you’re ready to serve the food, start the fire and get the grill ready. You should have three zones on your grill. A third of the grill should be covered with plenty of coal, to sear the meat. 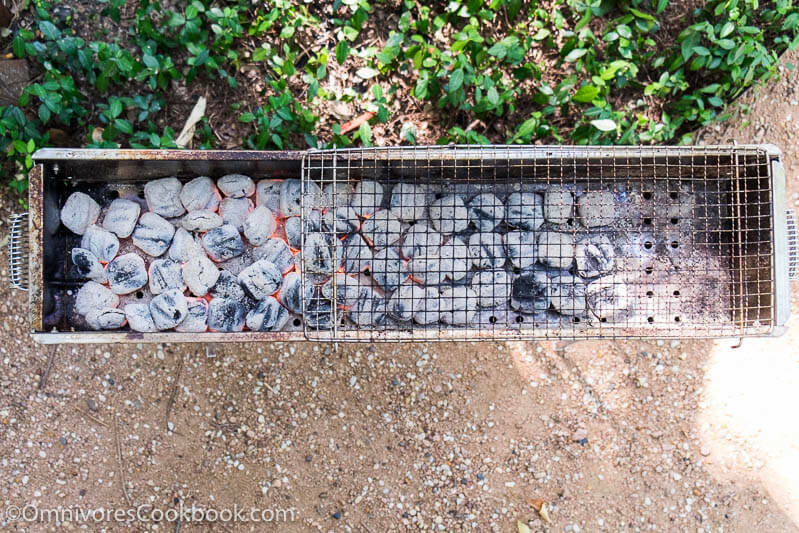 You should also have a large area with a single layer of coals for slower cooking. Leave a small space without any coal, on which to place the finished skewers and keep them warm. Do not pile more than three layers of briquettes on the hot zone. You want to sear the meat, not to burn it! Many Chinese grilling recipes call for smaller cuts of meat. You should always use a high heat to create a crispy crust, then move meat to the cooler fire to cook through. Cuts like party wings take longer to cook and may require you to move the wings back and forth between the hot and low heat zones. The little grill is so powerful that sometimes it only takes a few seconds to sear the meat. Always stay close to the grill and flip the food frequently. Unlike searing steak, we do not have the flip-per-minute rule here. If you’re cooking the lamb skewers properly (which means you also use lamb fat), the dripping fat will catch fire immediately. 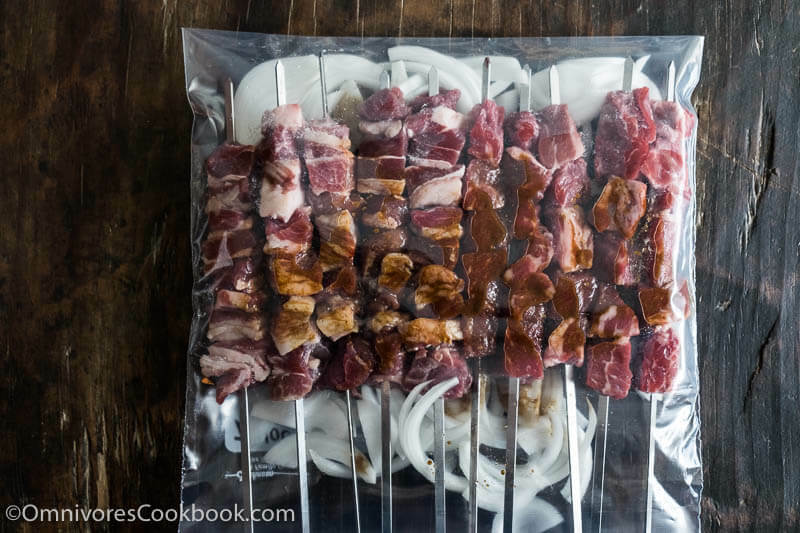 It will sear the whole skewers in two seconds and they’ll be ready for the indirect cooking. The food will taste different when you add salt and spices during the cooking. Spices such as cumin and chili pepper will lose their pungent fragrance once heated too much. Especially for lamb skewers or vegetables that do not require marinating, always add more spices at the end of cooking so they will be flavorful enough. We love eating our food smoking hot, right off the grill. At a Chinese grilling party, the food will always be served in small batches, once it has finished cooking. 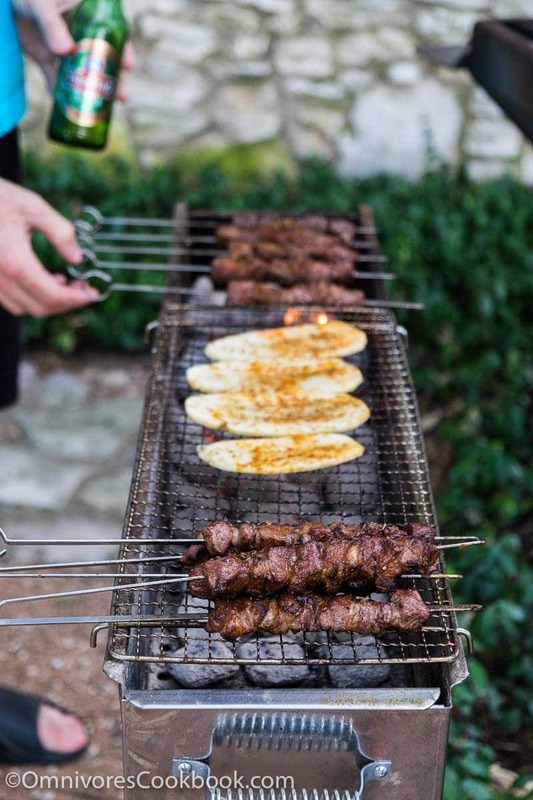 If you’re cooking lamb skewers for 10 guests, do not expect to serve the 30 skewers to be served at the same time. Also, you don’t need to cook just one course at a time. 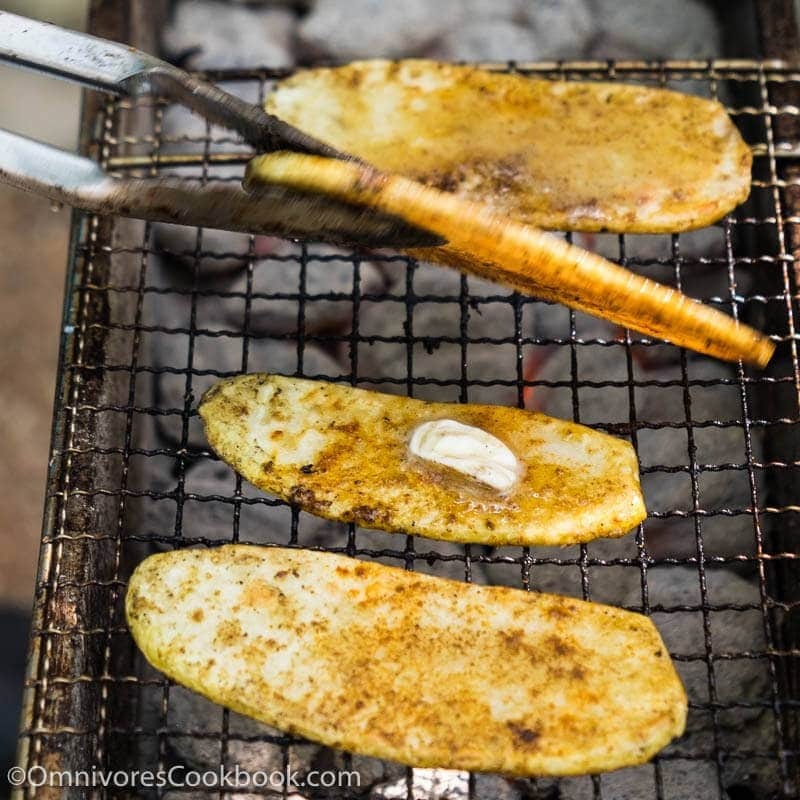 It’s perfectly fine to threw some vegetables and bread onto the grate while grilling the meat skewers. Always serve them once they’re done cooking. Keeping the whole process casual is the best practice. The fastest way to clean up is to move the burning coal into a heatproof container and place it in a safe place until the coals burn out. 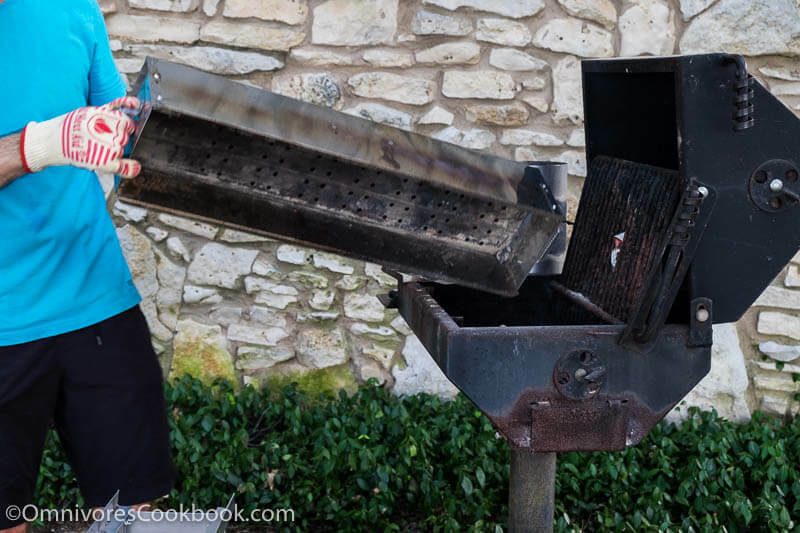 The grill box itself is separated from the supporting rack, so you can easily lift it and dump the ashes (don’t forget to put on your heat resistant gloves first!). 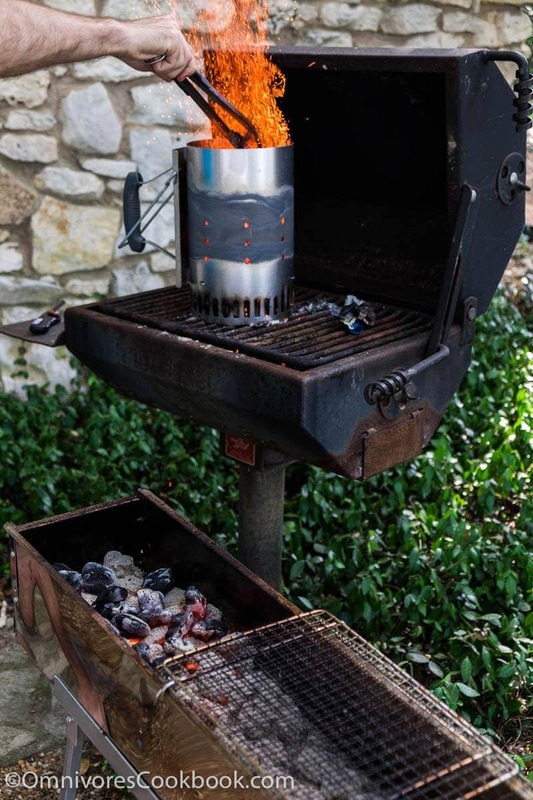 We always dump the remaining coals onto a public grill (we have a lot of them in Austin), close the lid and shut the vent. Then you can clean up the dripping juice with your grill brush while the grill is still hot. That’s all you need for a Chinese BBQ party! Thank you for taking time to read this super long post! 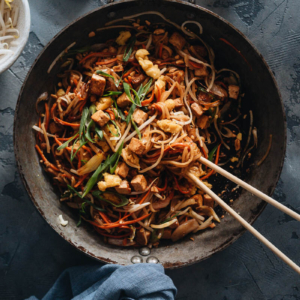 If you love Chinese food, don’t forget to subscribe to my FREE weekly newsletter to get the latest updates of my new recipes. Wow, you’ve certainly got everything covered in this post. And the photos are great! Now all I need to do is wait for summer to come to Australia – and I’m well and truly ready for it this year. This post has it all Maggie! Now I want to hold a grilling party and try all your recipes. The details and instructions are perfect – thanks so much! Wow Maggie, What a great post! This gave me some idea how I can host a Sukiyaki party as much as I would love to host a BBQ party <3. Great site! My family likes to grill cha shao (cha siu in Cantonese). We recently tried doing it kebab style (skewers). All the friends and relatives loved it.